A NY Times article sheds some light on the disarming of the Colombian paramilitaries that I discussed in my previous post. Human Rights Watch claims that the laws governing the disarming are basically a "get-out-of-jail-free card" and will prevent extradition of members of the paramilitary group to the U.S. on drug charges. 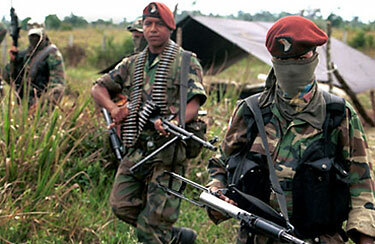 Incidentally, the paramilitaries control large parts of the country and are heavily involved in the drug trade. It basically boils down to the fact that the U.S. War on Drugs taking place in Colombia is really a war on the socialist/communist group, the FARC. It really has nothing to do with drugs. I guess this should not be all that surprising considering the recent history of warmongering by the U.S. government.